We are back from our trip. I mentioned in the post before that we would go outside of Europe. Well we went to Dubai, one of the Emirates in the Middle East. have their school holiday earlier this year. will put them into a movie soon to give you a better impression than only a camel on the beach. see on a beach, I had to share this. I think he looks cute posing his head like this. He probably knew I would put his face on the Internet…. Exploring different cultures is something I love to do, so my first time in the Middle East was a good one. And guess who I have met in person while in Dubai? Tammy from the blog T’s Daily Treasures! so we all met in the mall and had a good old chat. It was so nice to talk to her in person, like two old friends catching up. She made us some lovely gifts (I’ll show them in the movie) which was so thoughtful of her. This is what blogging does, connecting people you would otherwise never have met. Glad we did Tammy! hope your week will be a good one! Welcome back home! We know by experience how overwhelming that can be. No matter how great the time spent on holidays or away has been, we must catch up on time ‘lost’. But you all have added some fond memories and sure, meeting Tammy was an added bonus. Hier regen regen en regen en dat in mijn vrije week! Jammer hoor! We kunnen echt weinig ondernemen zo maar goed dat de winkels overdekt zijn! hihihihi. tuuuuuurlijk even lekker naar Dubai!!!!!! wat gaaaaaaaf, kan niet anders dan geweldig zijn geweest! geloof ik meteen!!! En ook nog zomaar even een blogdate……wat een ervaring! geniet nog lekker van je vakantie!! Hi Maureen. Good to see you here today. 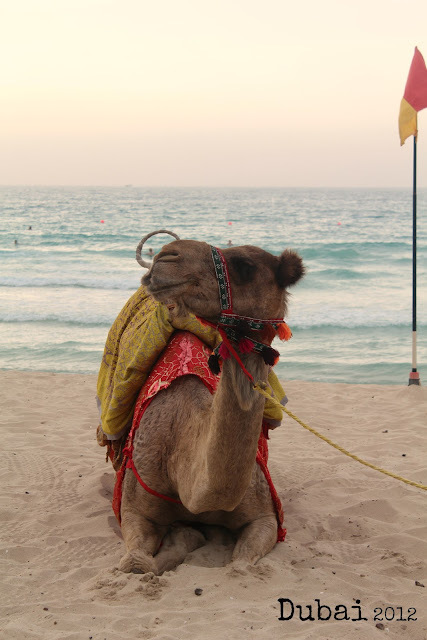 Love the photo of the camel on the beach. How wonderful to have had a trip to Dubai – quite an experience I would imagine. Looking forward to seeing the movie! How wonderful that you were able to meet up with another blogger while on your trip, I just love the karma of blogging. Dubai has been on radar for some time now – even more so after seeing that beautiful picture of the camel on the beach. It even looks like he is posing for the camera!